Marvin Besch, 78, formerly of Port Washington died Tuesday, June 14, 2005 at his Harbor Club Residence. 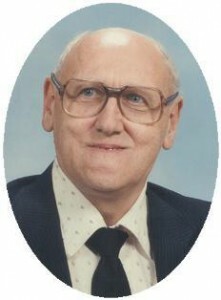 He was born in Lake Church, Wisconsin to Michael and Rose Watry Besch on March 8, 1922. In his youth he worked the family farm. In 1942 he took a job at Krier Preserving in Belgium. He joined the Army and served in Korea, achieving the rank of Sergeant upon his discharge in 1954. He returned the Krier’s and remained there until the late 1980’s, retiring as a shipping supervisor. He and his parents left the farm and moved to Port Washington. He continued to reside at the 200 E. Pierron Street address up until three months ago. He met Lozelle Kloss Thill of the Town of Belgium and married her April 8, 1978 at St. Nicholas Church in Dacada. She preceded him in death March 22, 1990. He was a life member of the American Legion Memorial Post 412, Belgium and a member of St. Peter Of Alcantara Catholic Church and the Catholic Order of Foresters. He enjoyed bus trips in Wisconsin and traveling throughout the country. Many mornings would be spent with the gang at Harry’s Restaurant and he was quite a dancer in his day. Marvin also loved to tinker in his workshop, creating wood crafts and lawn ornaments. He is survived by his nieces Sally Miescher of Reeseville, WI and Joanne (David) Zirbel of Lowell, WI, his step-children Henry (the late Diane) Thill of Cedar Grove, Diane (Kenneth) Kruschke of Adell and the late Janice (Tom) Hecox of Hartford. He is further survived by 8 step-grandchildren, 3 step-great grandchildren, great-nieces and nephews, other relatives and friends. He is preceded in death by his wife, Lozelle and his sister Sally Penoske. Funeral services 9:30 AM Saturday from the funeral home to St. Peter of Alcantara Catholic Church for Mass at 10 AM. The Reverend Pat Wendt will be the celebrant. Interment will take place in the parish cemetery. Visitation 5 – 7 PM Friday at the funeral home with a 5 PM Rosary Service.